Mommy's Favorite Things and Michelle from Mama's Baby Cupcakes. 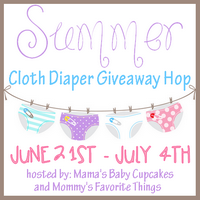 This is the 5th Annual "Summer Cloth Diaper" giveaway hop. Each blog has cloth diaper friendly items and has a minimum prize package of $25 per winner and after visiting my giveaway, make sure you use the linky below to take a look at the other blogs to see what they have to offer for you! When it comes to cloth diapering, there truly is no greater time for cloth than summertime!! Whether it's letting that fluffy bottom show and styling outfits to coordinate and show them off... or hanging your diapers out in the sun and admiring the rainbow of beautiful colors... there is just something about summer cloth that is just so FUN! Perhaps that why its bittersweet to say that this will be our final summer in cloth as my daughter very quickly transitions into the potty training stage. But...I'm enjoying these final days of cloth while they last and am so glad to have this final summer. 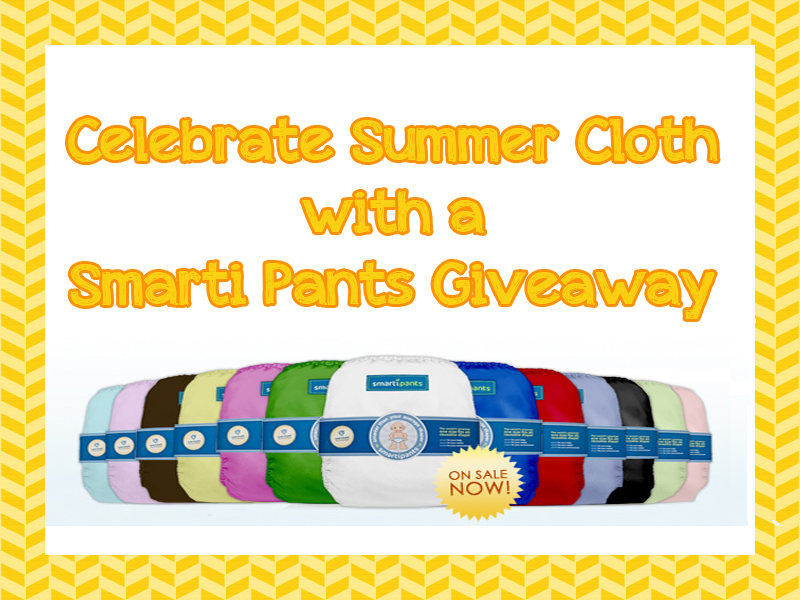 Smartipants™ diapers are both easy to use and easy to care for. Just place the absorbent insert into either side of the sleeve, and it will stay snugly in place until you remove the diaper from your baby. Once the diaper is removed, there's no need to take out the insert -- it comes out in the wash! Smart for your baby: Smartipants™ diapers feature our Leak-Guard Technology, keeping moisture contained, and your baby dry. Our diapers are made with “breathable” fibers and are free from any chemicals or irritants. Smartipants™ reusable diapers are designed to grow with your baby from newborn to toddler, babies 7lbs - 35lbs. Smart for your wallet: Instead of requiring 7,000 disposable diapers, the average baby needs only 24 reusable diapers, resulting in a net savings of nearly $3,000.00! In addition, Smartipants™ are not only the most advanced reusable diapers on the market, they are also the most affordable! Our products are all produced in our own local manufacturing facilities, and we are able to pass on those savings to you! Smart for your environment: Every year our country contributes roughly 3.4 million tons of disposable diaper waste into landfills. Using reusable diapers not only reduces the amount of solid waste, it also reduces the amount of harmful chemicals, oils, and trees required to produce them! Winner will be contacted via e-mail after giveaway ends, and will have 48 hours to respond before a new winner is chosen. One entry per household, winning entry will be verified. Odds of winning depend on valid entries received. 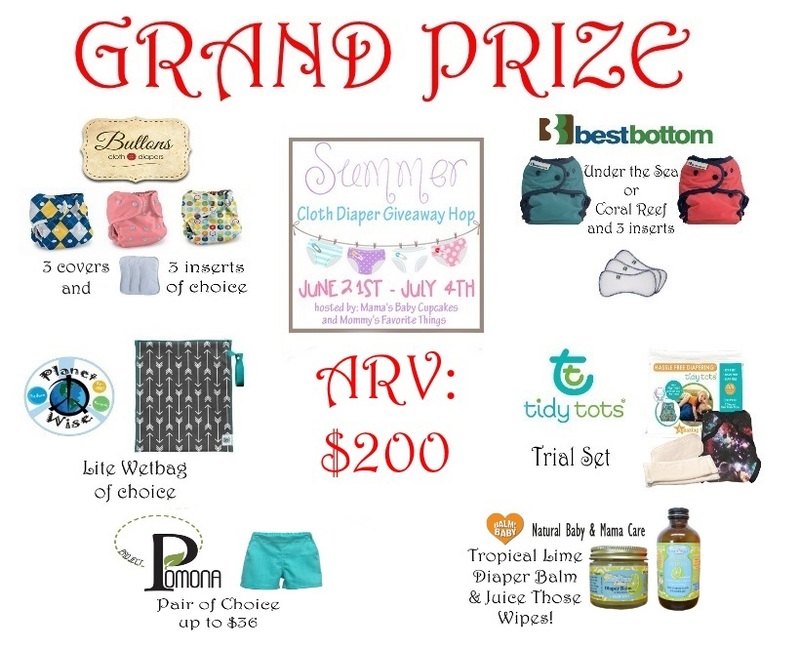 A Modern Day Fairy Tale is not responsible for prize delivery.Mama's Baby Cupcakes, Mommy's Favorite Things and the "Summer Cloth Diaper" participating bloggers are not responsible for sponsors who do not fulfill prize obligations. Yay for cloth butts!! Haven't tried Smarti Pants but would love to! I like the White Cheddar & Broccoli. Good, tasty and creamy. I would really love this for my niece or nephew. These sound awesome! Would love to try them! I love the bright colors!! I haven't tried this brand before, but I would love to!! We love cloth diapering! I'm new to cloth and really excited to hopefully win! I haven't tried these diapers before,but i would love to! I have never heard of this brand before, but they sound great and i love the colors! Cloth diapering is such a great way to save money and be green!